Many of us will give little or no thought to emergency lighting and for the majority the only time that we will need to find an alternative source of illumination is when the lights go out at home and we need to rummage around and find a torch (hopefully with a working battery) or the box of matches and the candles that you had for Christmas. But even at home, once that alternative light source has been located and powered up, a sense of calm prevails. Hopefully not many of us will experience a loss of light due to power failure in a large public building such as a theatre, cinema or department store. It is probably something we don’t want to consider but it is exactly this scenario, of hundreds of people in an unfamiliar environment , taken unawares and wanting to reach safety, with which emergency lighting is designed to cope. Across Europe and the rest of the world there is an extensive range of legislation with emergency lighting solutions being required to function from 30 minutes to 3 hours dependant on local legislation to the size and nature of the building but whatever the legal requirements emergency lighting has three main roles. But let us be clear from the start, we are talking about emergency lighting, not standby lighting which is something completely different! The primary role of emergency lighting is anti-panic, if people are plunged into darkness it will only take a very short time before levels of anxiety will rise and all too soon panic behaviour will be seen. Even the smallest amount of light is enough to provide reassurance, prevent panic and hopefully lead to a successful evacuation. Across Europe the general requirement for the floor level emergency lighting is 0.5 lux which in layman’s terms equates to the amount of light you would see if you outside at night under a full moon. Once calm has been restored the next function of the emergency lighting is to illuminate the escape routes so that people can exit to a safe area. As this requires people to start moving a high level of light is required, generally 1 lux and the light source for this will usually be ceiling mounted. The lighting for these exit routes needs to be homogenous with no bright spots or shady corners and consideration also needs to given to the colour rendering of the light, usually RA 40. It is assumed that once the regular light source has failed there is no alternative ie the fact that an office may have floor to ceiling windows is of no consequence when planning the emergency lighting, however a large, open plan office will not require as many emergency fittings as you would find in a stairwell where there are numerous changes of both level and direction. The third and final element of emergency lighting are the ever present, and often permanently illuminated exit signs. These will usually be lit on a permanent basis as evacuation of a building may be required even if the lighting has not failed. In some high risk areas, such as chemical plants, manufacturing units etc there may be an additional element of emergency lighting that is required to ensure that equipment and processes can be shut down safely before the area is cleared and these will require an even higher light level and specialist planning and installation. Changes in the provision of emergency lighting are mirroring those found in the regular lighting solutions and new builds are being fitted with both systems being based on the latest LED solutions and more and more refurbishments are also opting to utilise this highly effective technology. 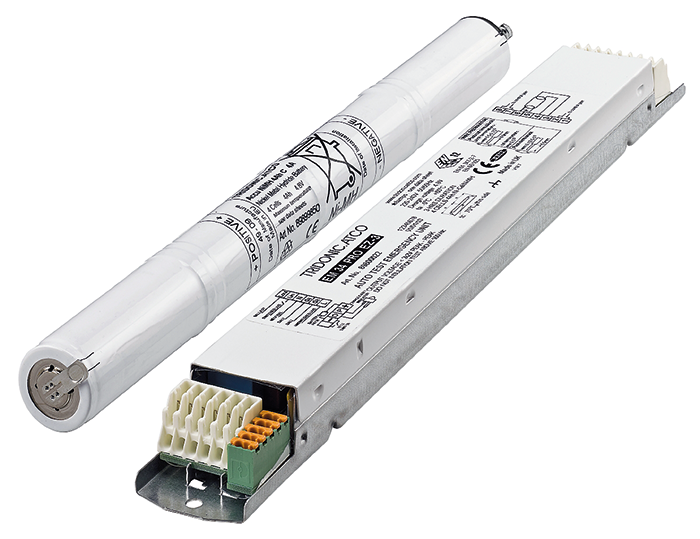 Using fluorescent luminaires for emergency lighting presents a number of challenges. Whilst these fittings will function well from the mains as soon as they have to operate from their smaller, integrated but less powerful emergency battery their performance is reduced and there is also a time delay in the unit emitting its full lumen capability (which impacts on the Emergency Lumen Factor). Not only that but from an installation point of view each different lamp be it 8, 13, 28 or 35 watt will require fitting with a different emergency battery unit which makes for a more complex and costly installation and maintenance programme. Adapting the fluorescent bulbs to cope with the switch to battery power is a complex process, the lamp can be damaged and this again has cost implications. when you switch on an LED there is no delay or warm up time, maximum light output is instant. Overall LEDs are more efficient, offer better light output per unit of battery, generate less heat and as a consequence the battery will last longer. Like any back up or contingency plan, you hope that you are never going to have to resort to your emergency lighting but should the need arise you want to be confident that it will work so regular testing is a must. Historically this has been done manually by a competent person physically testing each unit in a building individually and keeping robust and reliable records that could be referred to in case of a subsequent claim or enquiry. Not only was this time consuming, but if would often have to be undertaken out of hours, adding to the cost, and there was always the risk of human error either in the testing process or the recording procedures. As technology has evolved more and more luminaires have been fitted with a self-test capability. Fitted in the emergency unit, this intelligent controller will carry out either a weekly or monthly check that puts the unit into emergency mode and measures the response. If all functions correctly the small LED shines green, if there is a fault it will flash red to indicate that a fault has been detected. However it still requires someone to check each unit regularly, record any failures and take the necessary remedial action. Whilst some regard this as ‘fit and forget’ if you forget too much this could become negligence. The latest solutions utilise the industry wide DALI standard that removes the element of human error. A central control panel connects with the building wide DALI system and will instruct the units when to test the luminaires and will then compile all the results and provide a comprehensive report for the building or facilities manager who can then schedule the appropriate maintenance programme as and when required. A ‘soft record’ is kept on the controller and a hard copy can be printed off and kept in a fire safe should in need to be referred to at any time in the future. Looking to the future, this level of control is now moving to the cloud, where solutions like connecDIM offer an even greater level of control and monitoring, and the management of these systems can be done remotely. As more and more elements of a building’s infrastructure become measurable and manageable then the emergency lighting will become integrated, the LEDs will provide a more efficient light source and emergency lighting, should it be required will deliver those three key elements of anti-panic, safe movement and exit to safety. But even with all that in place it still might be worth checking the battery in your torch and knowing where the candles and matches are kept! John Kears is Product Manager for Emergency Lighting at Tridonic.